This program sets up one or more markets in which each person is a seller who chooses a production quantity. This is a Cournot game with linear demand and constant marginal cost. By setting the number of sellers to one, you can implement a monopoly problem, with optional random demand shocks. With monopoly, students will discover the optimal output, but relating this output to notions of marginal revenue and cost is instructive. 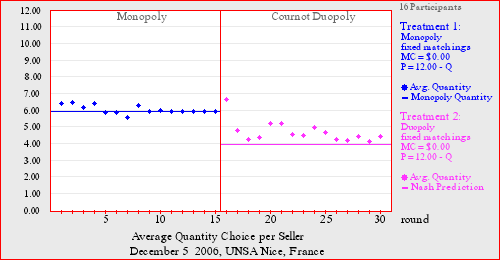 With an oligopoly setup, the experiment can be used to motivate discussion of a Nash/Cournot equilibrium. There may be tacit collusion with few sellers and fixed matchings, but competitive pressures tend to be high when there are three or more sellers in each group.